There's no arguing that salmon and steelhead in the Columbia and Snake Rivers have had a tough century. Habitat loss, overfishing, and, most of all, dam construction have reduced the prodigious runs, which once averaged 16 million fish per year, to a fraction of their former glory. What's up for debate is whether the federal government is finally taking adequate measures to protect the ones that remain. That ongoing dispute was renewed this month with the release of NOAA Fisheries Service's latest biological opinion, or "BiOp," an assessment of whether the federal government's plan for managing salmon and steelhead in the Columbia Basin is successfully protecting fish. By NOAA's own admission, the 2014 opinion doesn't much differ from its 2008 BiOp and a 2010 supplement, which a federal judge struck down in 2011 for their lack of specificity. 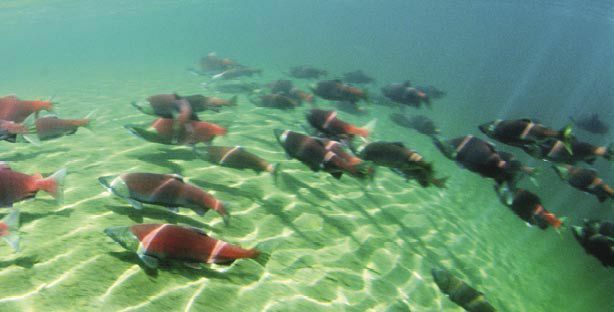 In this latest court-ordered version, NOAA concludes its salmon plan doesn't need an overhaul because its core conservation strategies -- especially habitat restoration -- are indeed staving off extinction for threatened and endangered fish. But salmon advocates complain that, while the status quo might be maintaining populations, it's not recovering them; and that by not considering more aggressive actions, NOAA's new BiOp consigns the Columbia's salmon and steelhead to permanent jeopardy. Conservationists and fishermen have long advocated for breaching the Columbia Basin's dams -- especially the four in eastern Washington that interrupt the lower Snake River, dams whose hydropower and transportation benefits are, they say, outweighed by their cost to salmon. Federal agencies like the Army Corps of Engineers and the Bonneville Power Administration, which markets the region's hydropower, have for years fought to keep the dams in place. Nonetheless, in 2009, Ken Olsen reported in High Country News that, thanks to a new generation of politicians and fisheries administrators, dam removal just might be nigh. "There are signs that the balance is tipping," Olsen wrote. Fast-forward half a decade, however, and the balance remains untipped. In a 2011 ruling, U.S. District Judge James Redden instructed NOAA to consider "more aggressive actions," such as removing dams and increasing spill -- water allowed to flow over dams, rather than through turbines, to help juvenile salmon migrate downriver -- in its next biological opinion. Yet the new BiOp actually rolls back spill in certain places, and doesn't address dam removal -- omissions that have drawn the ire of everyone from the Nez Perce Tribe to commercial fishermen. "The theory seems to be that if we do lots of little things, we can avoid dealing with the elephant in the room," says Glen Spain, Northwest director for the Pacific Coast Federation of Fishermen's Associations. "And that's the dams." NOAA officials and the opinion's proponents say that aggressive approaches like increased spill are unnecessary, and that current measures appear to be doing enough for fish abundance already. "We've improved thousands of acres of habitat and invested almost a hundred million dollars in estuary restoration," says Terry Flores, executive director of Northwest RiverPartners, an alliance that represents utilities, farmers, ports, and businesses. "Last year we saw a historic return of chinook over the Bonneville Dam" -- more than 1 million fish for the first time since the dam was constructed in 1938. Conservation groups want to increase the amount of water spilled over the Bonneville and other dams. Image courtesy of Wikimedia Commons user Visitor7. But Joseph Bogaard, executive director of the conservation group Save Our Wild Salmon, doesn't read too much into those numbers. For one thing, the chinook have benefited from favorable ocean conditions, including plentiful zooplankton, that won't last forever. And just because fall-run chinooks (which aren't listed under the Endangered Species Act) are surging doesn't mean that the Columbia's 13 endangered salmon and steelhead stocks are faring equally well. "None of the listed populations are showing that same growth," says Bogaard. "Those fish might be stable, but they're certainly not recovering." Greg Stahl, salmon program manager at Idaho Rivers United, points out that many biologists credit court-ordered spill for the strong chinook return -- evidence, he says, in favor of experimenting with increased spill. He adds that while habitat restoration projects are certainly welcome, they fail to address the root causes of salmon decline in the way that spilling does. "In Idaho, the problem is getting fish from the ocean to the pristine habitat we already have," he says. "Habitat restoration is like using aspirin to treat a brain tumor." Still, considering how contentious (and muddied by politics) salmon science can be, changing the process seems like a good place to start -- even if it this particular plan is destined to appear before a judge. "The merry-go-round might be slowing the slide toward extinction," says Stahl. "But real solutions involve bringing people together." Ben Goldfarb is an editorial intern at High Country News.